Amish and Mennonite communities have long supported mission and relief efforts for the country of Haiti. According to The Amish, the first Haiti benefit auction was held in 1978 in northern Indiana, with the second starting in Ohio a few years later (p. 456, footnote # 50). Money raised by the annual sales goes to support an assortment of charity groups operating in the country. The first Haiti auction of the year kicks off two weeks from today in Sarasota, Florida, with around a half-dozen more throughout the year in states including New York, Pennsylvania, and Kentucky. Something I did not know: a Sarasota-area reader shares that “The HBA has fundraisers ahead of the auction so that all donations on the day of the auction go to benefit Haiti.” This included a December barbecue chicken fundraiser in Pinecraft Park to cover auction expenses. 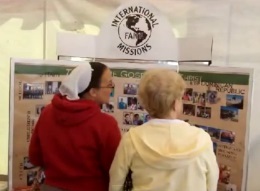 Read more on Amish Haiti benefit and mission involvement. There is a missing date (Illinois) which I’ll plug in when I get it. 345 S. Van Buren St.
Below is a video on last year’s Florida Haiti auction, held at the Sarasota County Fairgrounds. Video author Ernest Bontrager explains that the money from this sale went to ten different missions, including an orphanage, a Christian literature organization, and a school for the deaf. Hang around in the video til at least the 3:10 mark, when you’ll hear the talents of Voice of Praise, a Virginia Mennonite a capella quartet, who sang in last year’s edition. I have been at the New York Haiti Auction. There is something for everyone – young, old, men women, child. Their food is delicious. It is really something to see and enjoy. Just bring your money with you. There will be something there you want. I hope to attend one of these benefit auctions sometime in my life. The video of the pie table alone has me “sold”! I’m sure I’d find much more to buy there than I could possibly carry home! Knowing the proceeds go to a good cause would make it that much easier for me to part with my money, too. Thank you for this post & video. I love the a cappela singing—did I hear it’s from a CD? Would it be available for purchase? I’d be interested! Thank you, Linda, for the link. The song titles with arrows will play a sample track of a cappella singing, lasting about 30 seconds. Can anyone tell me why the Amish are so interested in fundraising & sending money to specifically Haiti? Are there Amish there for instance? Why not other worthy causes like hurricane relief (Sandy? ), the Tsunami in Japan, or other struggling countries (Nicurargara, Africa, etc)? Thanks!! Amish do in fact do a good bit of US-based relief/charity work, for example hurricane and storm relief is common (Sandy, Katrina and others). Truth be told it’s kind of odd for the Amish to be involved in international outreach but you do see it in various forms. I know of one Amish person who went to Southeast Asia as a youth to help rebuild after the tsunami, I believe it was Indonesia. It seems like I once read or heard of why Amish and Mennonites were originally drawn to Haiti, but not finding it in my memory banks or some sources I’ve checked. Will let you know if I do, or someone else here may know. A good question.